I’m so pleased to be able to share this reader feature from another young family with you. 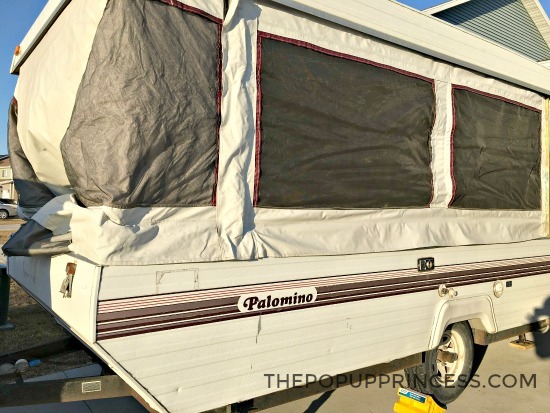 My biggest regret is that we didn’t buy our camper sooner. 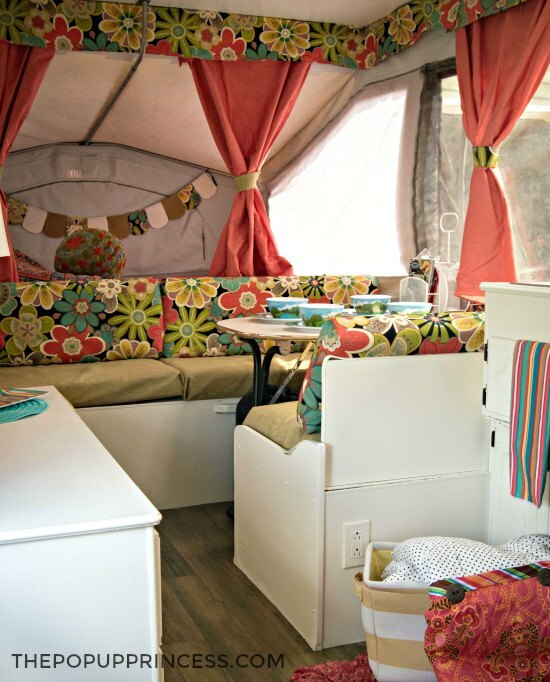 I constantly lament all the opportunities we missed when our kids were very young, so I get so excited to see young families exploring the country together in their pop up campers. I get to live vicariously through them! 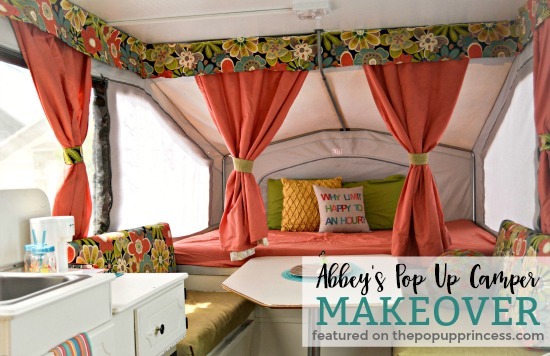 This latest feature comes from a reader named Abbey, who got hooked on the blog after her husband, Matt, decided he needed a pop up camper. Mustang Sally’s transformation began almost immediately. Knowing they had a super tight budget, Abbey and Matt established their goals and created a plan. 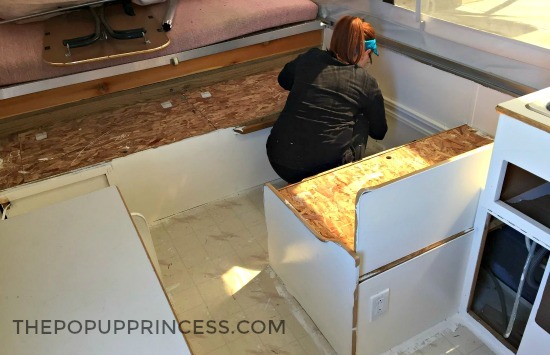 They knew they needed to clean, make repairs, paint, and update both the fabrics and flooring. Abbey wanted a fun new look, while Matt was more concerned about functionality. They only had two months two months to do everything, so they had to get going quickly. Next up was fabric. This was the most expensive and challenging part of the renovation process for Abbey. 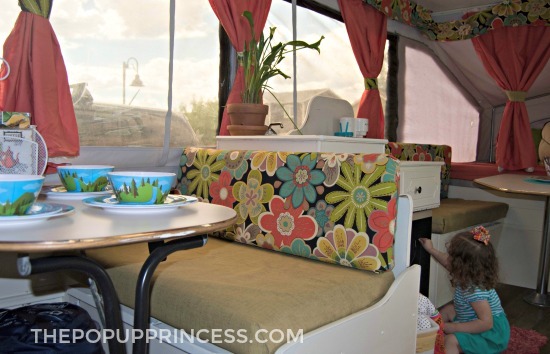 She knew they wanted to use outdoor fabric for the seating, and that did cost more, but they were able to find the seat cushion fabric at JoAnn Fabrics on clearance. They also had a coupon, which brought down the total. For the funky floral, Abbey shopped Fabic.com during a sale. 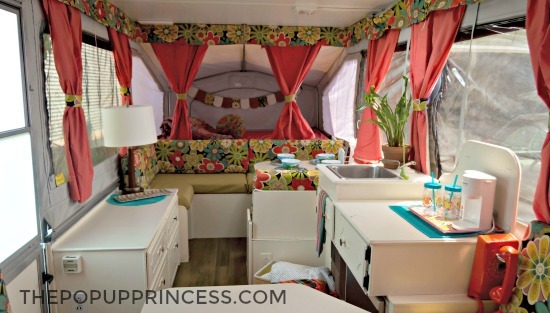 She ordered enough to complete the seat backs and valance along the curtains. For all the cushions, Abbey and Matt watched a lot of YouTube videos and read a lot of Pinterest posts. They managed to fashion their take on slip covers with snap back closures, which can be removed for cleaning. Abbey put the original curtains through the washing machine and covered them with new fabric. 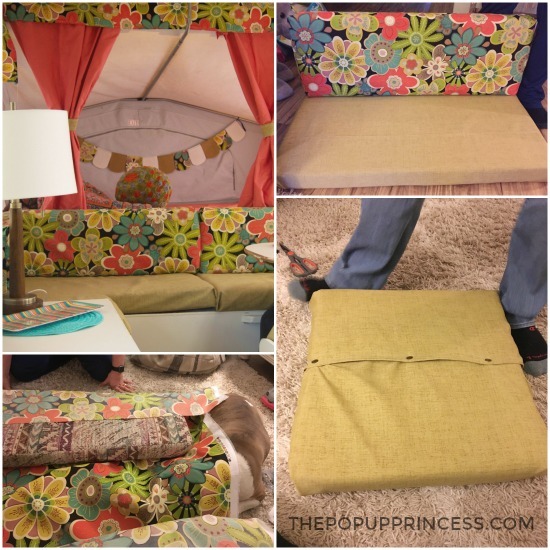 She purchased clearance twin sheets, then measured and cut new panels which she sewed over the existing curtains. Now they look much cuter but still have the utility of the previous curtains. They used the same method for the curtain tie-backs. Then they made a new valance and stapled it to the ceiling, as that was how the original valance had been previously attached. Matt and Abbey purchased matching fitted sheets for the beds, too. After the fabrics were settled, Matt tackled the flooring. Abbey tells me this really made the transformation complete. Matt went to Lumber Liquidators for flooring and selected a peel-and-stick vinyl option, which was a breeze to install. 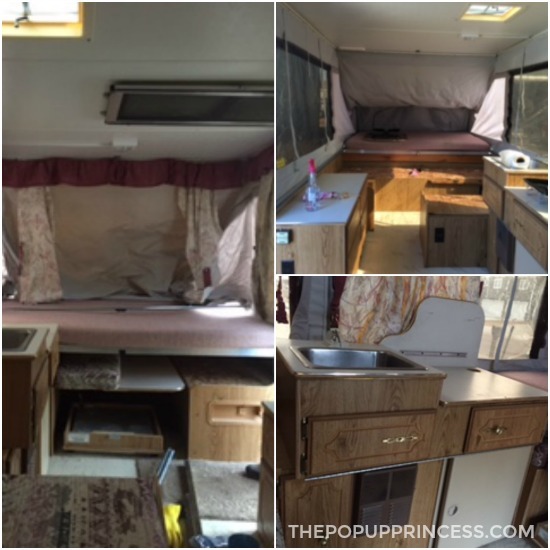 While Abbey was initially concerned about durability, she says it has held up wonderfully. With the major remodeling tasks out of the way, Abbey got to take on the fun part–decorating. This is where Matt and Abbey had differing views. Abbey thought decor was essential… Matt, not so much. Luckily, the local dollar store had colorful summer home decor that was pretty and functional for Sally. Abbey did a great job accessorizing. This summer Abbey and Matt took Sally out to reap the rewards of all their hard work. 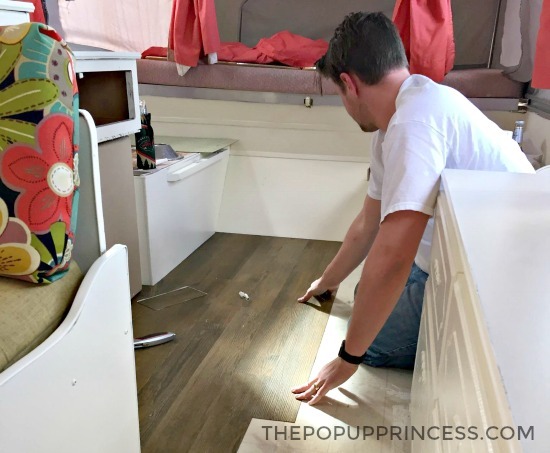 They quickly learned that camping with a one and two-year-old has its challenges, but are happy to report that making memories in their fun and functional space will always be worth it. What an amazing remodel! Great job! I love it! We also have a Mustang Popup but ours does not have the second dinette. Poly over the paint- who would have known?! Ours has been chipping because we did not do that.